Under 12 League Cup winners Yaxley Blue. They are Lewis Arber, Christopher Brazil, Francis Buckle, Ceri Hayes, Max Hill, Morgan Hossack, Daniel Irving, Harvey Laughton, Adrijan Lutolli, Taylor Roan, Louis Rodrguez, Connor Sanderson, Luke Simpson-Morris, Liam Unalkat and coaching staff Seb Hayes, Mark Arber and Ian Laughton. 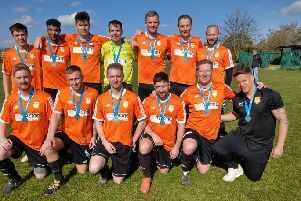 There was junior cup final glory for Yaxley, March Soccer School and Stamford yesterday (March 26). Three finals took place at Chestnut Avenue and first to get their names on a trophy were Yaxley Blue. They won the Under 12 League Cup final 2-1 against Glinton & Northborough Amber. Under 12 League Cup runners-up Glinton and Northborough Amber. They are Stephen Bliss, Freddie Butcher, Louis Diemh, Archie East, Finlay Hopkins, Ben Hutson, Tommy Johnson, Jamie Nixon, Logan Noble, Luke O'Donnell, Samme Oliviero, Harvey Robertson, Circe Rodgers, Eden Spooner, Nathan Whitfield with coaching staff Ian Hopkins and Simon Butcher. Harvey Laughton and Connor Sanderson got the goals which puts Yaxley on course for the league and cup double. They need one more win from their two remaining Division One fixtures to take the title. On target for Glinton, who play in Division Two, was Circe Rodgers while Yaxley’s Morgan Hossack received the man-of-the-match award. Next up was the Under 12 Hereward Cup final and here there was a big win for March Soccer School. They beat Division Three rivals Northern Star 7-1 thanks to goals by Archie Cullum (2), Brandon Wojtowych (2), Jack Conyard, Alex Neve and Bailey Yeomans with Murilo Dominguez netting for Star. Under 12 Hereward Cup winners March Soccer School. They are Jack Brown, Bobby Byles, Jack Conyard, Archie Cullum, Charlie Gatty, Alex Neve, Thomas Oakley, Callum Racey, Brandon Towell, Codi Wedge, Brandon Wojtowych, Bailey Yeomans. Bobby Byles was voted man-of-the-match for March, who are also now on course for a league and cup double. The third final saw Stamford Red take on Spalding United Blue in the PFA Under 11 decider and Stamford won this one 3-2 on penalties after a 2-2 draw. Liam Smith hit both Spalding goals while man-of-the-match Matthew Walker and Fryderyk Dametka struck for Stamford. Under 12 Hereward Cup runners-up Peterborough Northern Star. They are Mehdiy Bogheri, Elyas Bonsaada, Dylan Burton, Dominic Ciara Baldwin, William Creasey, Murilo Dominguez, Harry Hewitt, Ryan Hewitt, Jayden Holman, Bailey Mayhead, Alfie Rayment, Lewis Sharpe, George Simpson-Newton, Jeevan Singh with coaching staff Nick Darani and Mike Bell. Under 11 PFA Cup winners Stamford Red. They are Ethan Paragreen, Hayden Theodore, Joe Paragreen, Charlie Hex, Matthew Walker, Riley Kendle, William Towe, James Bennett, Archie Smith, Fryderyk Dametka, Jake Downs with coaching staff Paul Walker and Simon Towe. Under 11 PFA Cup runners-up Spalding United Blue. They are Charlie Bell, Joshua Caller, Jack Haunch, Samir Cookson, Connor Beeken, Richard Hall, Derrie Maxwell, Liam Smith, Alex Metiu, Keane Slayven, Miguel Moitinho, Ethan Marshall, Alfie Lewis with coaching staff Neil Maxwell and Richard Smith.